Heat oven to 350°F. Brush 12 regular-size muffin cups with 1 tablespoon of the melted butter. Separate dough into 8 biscuits. Split each biscuit in half to make 16 biscuit rounds. Cut each biscuit round into 3 triangle-shaped pieces. Press each piece to 2 inches in diameter, and fill with 1/2 teaspoon cream cheese spread. Fold over dough, and gently crimp it around cream cheese to form a ball. Place 4 balls in each muffin cup; brush generously with remaining 2 tablespoons melted butter. Sprinkle 1/4 teaspoon everything bagel seasoning on top of each mini monkey bread. Bake 18 to 22 minutes or until golden brown on top. Cool 5 minutes. Gently remove from muffin cups. Everything bagel seasoning can be purchased premade in a jar. If you would like to make a quick and easy version of this seasoning, mix 2 teaspoons each dried chopped onion, dried minced garlic, poppy seed and sesame seed with 1 teaspoon kosher salt. Any leftover seasoning mix can be stored covered in a small jar or small resealable food-storage plastic bag to be used on everything from scrambled eggs to cooked vegetables. 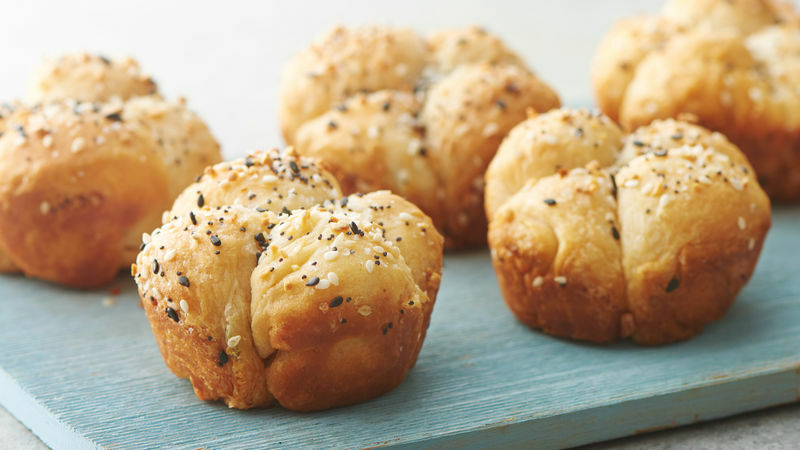 If preferred, you can substitute 1 tablespoon plain sesame seed or poppy seed for everything bagel seasoning.